When I laid down on my couch Thursday, i was all prepared to watch my favorite night of television. Two hours later, I woke up thinking I was late for work. I panicked for a moment until I realized what was happening. Then I went straight back to sleep. I didn't even know I was tired. It wasn't just a doze. It was an all-out deep sleep. When I woke up after two more hours of snoring away, I decided it was time for some dinner. I made myself a grilled cheese sandwich on this "cracked wheat" sandwich bread I got at Dillons. Even though it doesn't come from Target, the bread is really tasty! I sent out a couple of emails and finished reading a book I had been putting off. I read some more about Chris Benoit and set up some bills to be paid. Then I decided it was time for bed. On my way, I remembered that I had run out of soap during my morning shower, so I grabbed a new bottle. I opened the shower curtain. Then I was horrified. It was hanging out in the corner of the tub. Just standing there under where I rest my foot once a year when I decide to shave my legs. A giant spider. Instead, I grabbed a glass. I trapped that sucker and moved him along the bathtub floor until he was close enough that I could see him well. Sure enough, there was a big fiddle on his back. This time, instead of having a total mental breakdown, I went into torture mode. I turned on the faucet and watched the water creep up around the spider. The spider was significantly larger than his cousin was a month ago. I had to make sure to get the water pretty deep. I didn't want him to be able to kick off the floor over to the side of the tub. Ol' Spidey knew what was coming. He scrambled inside the glass, trying to get to higher ground. "Much too late, my eight-legged friend!" I lifted the glass and watched Spidey try to swim. He lasted much longer than I thought he would. The cat and I waited until he curled up his legs. I poked at him a few times to make sure he wasn't pretending to be dead. Then I pulled out the camera and started snapping. I even scooped him out of the water and shoved the camera right down into the glass with him. I decided to cancel all my tentative weekend plans and clean. This weekend, my goal is to really clean this place. You all have great faith in me, right? I called Jacque this morning and told her about my new dead pet. "I think I've killed three in the past couple of days," she sympathized. "Brown Recluses or just spiders?" "Brown Recluses. I think. I'm not sure. They're always too smashed to tell." I've heard that spiders were bad this year, but this is ridiculous! Especially now that the rain is forcing them indoors. As I talked to Jacque, I glanced over and saw my Spidey was uncurled. "That's weird," I thought. "Maybe it happened when he dried out." I tapped on the glass. AND THE SPIDER RAN ROUND!!! This is just great! 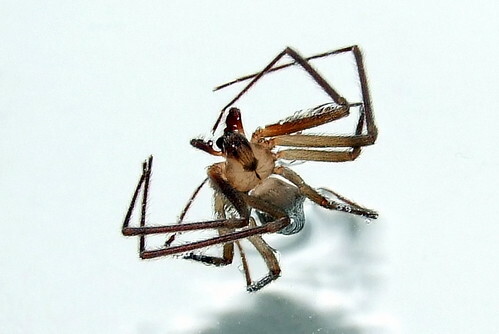 Not only am I worried about Brown Recluse spiders infesting my home, now I've got a zombie spider!